This week we bring the jam! J.D. offers up alternatives to Photoshop as El Kaiser tries to find something decent to watch on Netflix and answers listener mail. In the news, the U.S. Emergency Alert System might be vulnerable to hackers; Google patches a 4 year old vulnerability in the Android mobile OS; bookseller Barnes & Noble get out of the tablet business; and the Mars rovers continue to do their thing on the Red Planet. 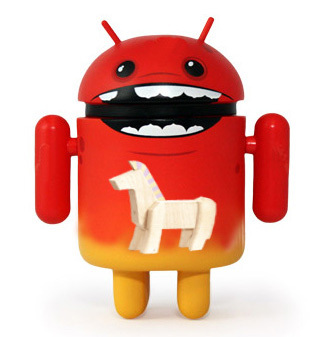 Bluebox Security found a big ol’ hole in Android last week — something about any app potentially turning into a nasty Trojan horse to get all up in your business. Google quickly whipped up a patch and pushed it out to smartphone OEMs for distribution and spokesperson said even though there’s a flaw, most users don’t have to worry about it. As for Android, new numbers from Google this week that show that the Jelly Bean flavor of the system, (versions 4.1 and 4.2), have now combined to beat out the older Gingerbread 2.3 on active devices, with Ice Cream Sammich (version 4.0) firmly in third place. Samsung’s Galaxy S3 and S4 phones are thought to be behind the surge in Jelly Bean use over the past year or so. So now we wait for a slice of Key Lime Pie. The Boy Genius Report Web site claims to have news of Amazon’s plans for its next batch of Kindle Fire tablets. According to the BGR, Amazon has three new versions of the Kindle Fire in the works to debut this fall. While Amazon’s Kindle Fire tablets are doing well, Barnes & Noble Way announced last week that it was getting out of the tablet business and leaving third-party hardware companies to build any future Nook tablets and the B&N CEO has now resigned. Not surprisingly, Microsoft has been mentioned as a potential buyer for the Nook business. Some are speculating that Barnes & Noble ditched the Nook in order to save its brick-and-mortar bookstores from extinction. As promised earlier this year, Facebook is now rolling out its Graph Search feature across user accounts here in the US. (Graph Search is the new Facebook tool that lets users make very specific searches. If you’ve been on Facebook for a while, this might be a good time to review your privacy settings. In other social-networking news, Twitter updated its mobile apps this week with improvements to its own mobile search tool and direct message sync across all devices and platforms. Apple TV, which added a few premium channel apps for cable subscribers last month, is reportedly in talks with Time Warner Cable to let subscribers watch their channels on the little black set-top box, according to Bloomberg News. And CNET reports that Beats Electronics is hoping to partner with AT&T for its new music subscription service. Meanwhile, up on Mars, the Curiosity rover took a video of a Martian moonrise and its older sibling, the Opportunity rover just celebrated the 10th anniversary of its launch toward the Red Planet. While Martians used to be the stuff of fantasy, there’s a recent essay by Judith Shulevitz in the current New Republic magazine called “And the Martians Shall Save the University — Why Do We need the Liberal Arts? Because It Gave Us Sci-Fi.” If you like science, science fiction — or just find it really cool that a writer can dream up fantastic inventions to inspire engineers and researchers to build for real, give it a read. But first, go check your Facebook privacy settings.